Kelly Hawes graduated from the Savannah College of Art and Design in 1992 with a BA in Illustration, after completing a specialized study in children’s book illustration. In 1994, Kelly settled in Wilmington, North Carolina, to pursue a career in art. Her work appears in many private homes and businesses in Wilmington and surrounding areas. Kelly’s work includes canvases, business logos, product labels, product design, T-shirt design, and painted furniture. Kelly typically works in acrylic, guache, watercolor, pen and pencil. Her work can be bold and imaginative or delicate and organic. Her most vivid canvases simulate the appearance of Russian lacquer. Some of Kelly’s commercial clients over the past few years have included Michael’s Seafood Restaurant, Hollywood East Cinema Grill, Silver Coast Winery, Down Island Traders, Ogden Family Chiropractic, Carolina Kayak, Club Tropics, Stars of Magic, Sea Horse Gallery, the Wookey Hole, Rum Island, and Fire & Spice Gourmet. Homeowners frequently commission Kelly to create original paintings. They appreciate Kelly’s interpretation of wildlife and nature scenes, such as beachscapes, ocean life, tropical jungles and forests. Kelly specializes in painting animals such as local marsh birds, parrots, tropical fish, lizards and various jungle cats. Clients ask her to paint flower borders on furniture and walls, using the same motifs that appear in their favorite upholstery or decorative fabric. Kelly enjoys painting imaginative children’s rooms and nurseries. Her fantasy art is a great hit with children. They especially enjoy her dinosaurs, animals, angels, mermaids and fairies. Kelly can recreate your child’s favorite fairy tales throughout a room or suite. Her animals can look realistic or can show entertaining human characteristics. Kelly often shows an appreciation of the feminine form in her artwork. Inspired by her love of Middle Eastern dance, she is creating a series of canvases featuring joyful belly dancers of all shapes and sizes. All photos, artwork and site content are copyrighted. No one may alter or use photos, artwork or site content without the permission of the artist, Kelly Hawes. 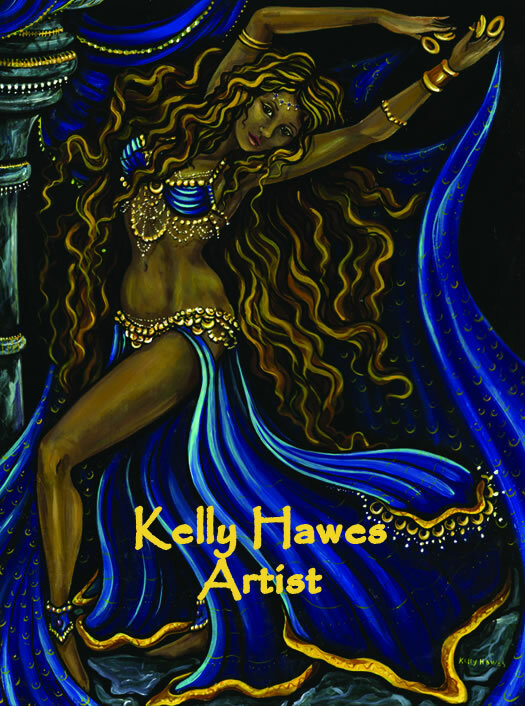 Due to the high number of requests received regarding free usage of her artwork, Kelly Hawes regrets that she is no longer able grant usage of her artwork without some kind of financial compensation or trade of products and services. Unauthorized and/or uncompensated use will be regarded as theft. Wilmington Web Design by Venue Communications, Inc.